A UNESCO World Heritage Site, Tulum is renowned across the planet for its incredible Maya ruins and stunning photogenic beauty. Home to aquamarine seas, ancient archaeological sites, and the largest protected area on the Mexican Caribbean coast — the Sian Ka’an Biosphere Reserve — Tulum is an unmissable spot for travel lovers everywhere. Quite apart from its natural beauty and deep history, Tulum is also home to some of the finest vacation rentals in Mexico. If you’re planning an adventure to the Riviera Maya, make sure to stay in one of these luxury villas in Tulum. Understated yet seductively luxurious, Casa Ixchel is an exquisite Tulum getaway tucked between the Caribbean Sea and lush jungle. Those with an artistic eye will adore its minimalist and modern design. The luxury living room features two L-shaped sectionals faced together for an intimate gathering while the room is illuminated with natural light thanks to a giant Nano door that opens onto the expansive terrace and pool area. Situated at the end of the hotel zone, the all-inclusive Casa Ixchel is peaceful but close to buzzing Tulum and its excellent restaurants and bars. In particular, you are right next to Hartwood restaurant, probably Tulum’s most famous eatery. The recently renovated Villa Miramar boasts unbelievable access to the historical Maya archaeological site of Tulum. Just five minutes’ drive away, guests to this luxury vacation rental can explore this world-famous site on the stunning Caribbean coast. The villa itself comes with five en-suite bedrooms, each with its own private entrance offering hotel-room privacy. 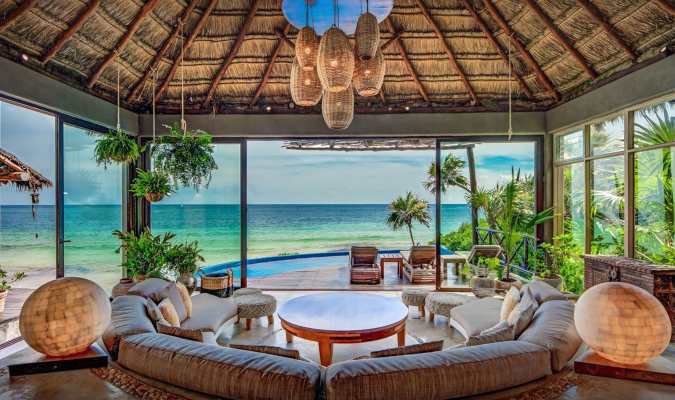 Guests can gather under the majestic thatched-roof palapa which covers the open-plan living room and dining area. Floor-to-ceiling glass doors blur the boundary between inside and out. Ideal for the fiesta-lover, Villa Miramar comes with a swimming pool, bar and lounge area, and a cocktail deck. Play your favorite tunes from the iPod dock and party under the stars. Those who are looking to unwind can relax on the lounge chairs and enjoy the ocean views. Lying in the heart of the hotel zone, Casa Chukum is a beachfront luxury villa in Tulum with majestic ocean views and an unbeatable location. The four-bed rental boasts relaxed décor with solid wood furniture and an earthy color palette. The bedrooms come with platform wood beds, crisp white linens, and wood beam ceilings. Each has its own elegant en-suite. Two come with walk-in closets and private terraces with gorgeous views. Another features a queen and twin beds, plus sliding barn doors that lead to a loft sleeping area. The pool house suite comes with two queen beds and a small living room. Away from the main house, you’ll find a terrace with ocean vistas, comfy bean bags, an outdoor sofa, and a hammock — the perfect place to kick back and enjoy the views. The pool house comes with an outdoor bar and private patio. 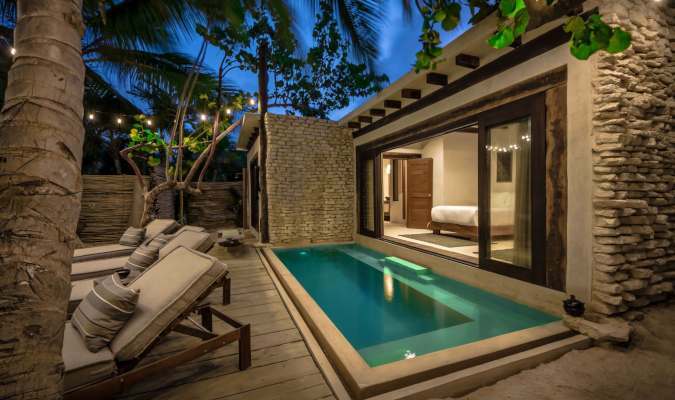 The newest villa in our exclusive Tulum portfolio, Tulum Treehouse is a beautifully understated Mexican villa created by a diverse group of designers and artisans. The exceptionally well-crafted villa boasts large common areas, indoor-outdoor dining, and five bedrooms with en-suite bathrooms. The décor utilizes locally-sourced Tzalam wood contrasted against polished white cement. The décor includes local textiles and ceramics, Oaxacan rugs, and bespoke furnishings by Meridan artisans and from Mexico City’s weekend antique market. The designers of Tulum Treehouse have created an eco-friendly paradise to complement the natural beauty in which it sits. Solar panels offer power while a back-up generator provides support. A water treatment and irrigation system helps to preserve the local ecosystem. Lush mangrove jungle surrounds Tulum Treehouse providing spectacular views for guests, while adventurers can take a beach road from the Treehouse straight to the Sian Ka’an Biosphere Reserve. 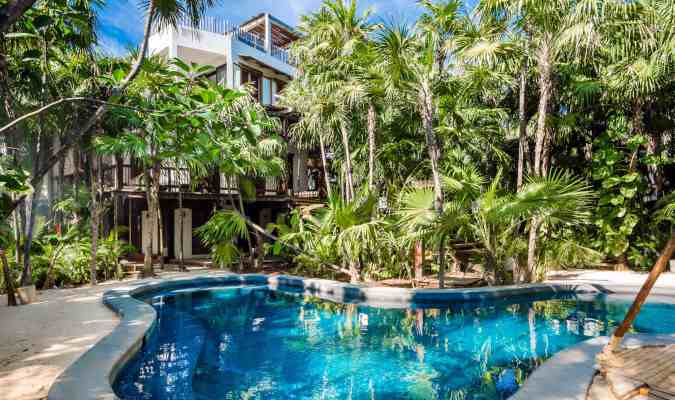 Want to book a luxury villa in Tulum? As one of the finest vacation destinations in Mexico, you won’t regret booking a stay in one of these luxury Tulum getaways. Speak to us today to reserve your place.